Finally, the cat is out of the bag. The dashing RBI Governor Raghuram Rajan, whose 3 year stint as the boss of India's central bank saw him handle multiple grave challenges with aplomb, has finally called it a day. He will not accept a second term, is what the official RBI note (released 18-06-2016) says. Stabilising the boat when everything was choppy - In 2013, I distinctly remember taking classes discussing economic developments and the mood was of despondency. The rupee was in free fall, everyone was doubting the economy's long-term prospects, a rudderless administration was all that was visible, etc. In that scenario, he accepted the challenge and rose to the occasion like a mighty warrior. His presence soon was enough to calm nervous temperaments. In retrospect, if he did not believe in the India story, and was not "Indian enough", he could easily have refused the offer. I read in various publications that international investors found his mere presence very reassuring. There are fears that the rupee may take a hit now, fearing many populist measures by the new boss (that's pure speculation, though). Making the real tough calls - The government banks are in a serious mess today, due to the multiple wrong decision taken during the mini-credit boom of 2011. Most have bleeding balance sheets, and literally no power to take to task the mighty industrial groups that have nearly lost the ability to repay tens of thousands of crores of rupees (partly due to their over-optimism, partly due to global headwinds and local turbulence, and partly due to plain, simple venality). In this backdrop, Governor Rajan took to task almost everyone responsible in the system, and forced them to "call a spade a spade". The markets did not panic - they rejoiced, as identifying a disease bravely and correctly is indeed the first solid step towards administering the right medicine. 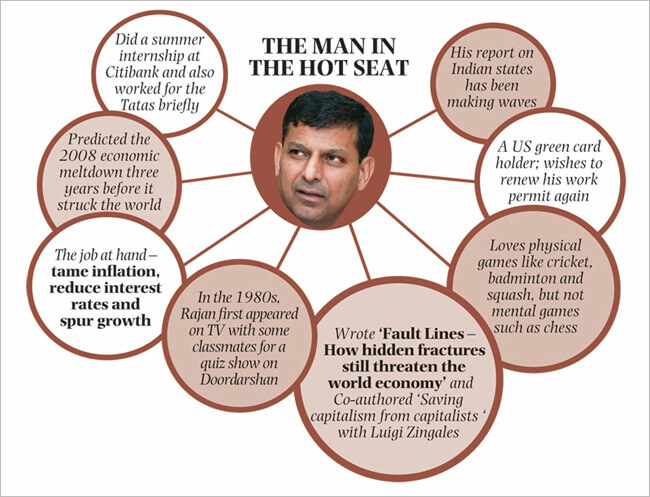 The Indian banking system was on its way to repair (and I hope it'll continue to be so), and there'd be no more Rajan. He also openly chided the PSU Banks for not passing on the rate-cuts down the line, and reminded everyone that mere dropping the rates would serve no purpose. multiple complex legacy reasons), constant calls for policy rate cuts can drive even the most academic of governors crazy. And then a very public blame game starts. 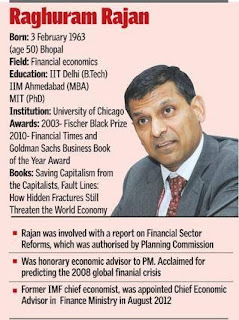 Rajan had the guts to openly remind everyone, the most patriotic and zealot of Indians included, that a GDP growth rate of 7.5% is not to be celebrated till the majority of Indians struggling to lead a decent life (due to the very low per capita income of less than USD 2000) are empowered and enriched. This is what I have been telling my students for years now. It is something every patriotic Indian, who is sensitive enough to read statistics and numbers without prejudice, will say. Unfortunately, perhaps this proved too much for many. Of course, the RBI is much bigger than the man. And the RBI will continue to govern monetary policy as always. Perhaps the next guy to come in will even be better. India will move on. But all this leaves a bad taste in the mouth as it is a reminder of the fact that patriotism seems to be patriotic only as long as you are willing to never criticise. That is not a healthy sign. And with food inflation again raising its ugly head (due to persistent supply-side problems), it'll be interesting to watch what the new guy does. I love the prime minister's style of working, the way he packages schemes and markets them, and connects the myriad dots to make the big picture apparent. It is a rare skill. His drive to truly change the orbit of India is unmistakable, just like his indefatigable and honest ways of working. But at the same time, if he fails to control some of the fringe elements who so regularly throw a spanner in the good works that many others do, it is everyone's loss. Here's what I feel - India is one of the oldest civilisations in the world, with a culture and history that's unparalleled. But modern Indians are a pale shadow of the great ancestors who built this land and its deep traditions. We are largely careless, callous, shirkers, with no sense of excellence and very superficial patriotism. If we truly have to become a great nation, we have to focus single-mindedly on raising the quality of life of our people (which will include higher productivity from everyone, no freebies, less of criticism and more of contribution, and much more). That's what a lot of us hate to do. Have a great time back in academia, Mr Rajan. It was a pleasure to see your work and attitude in these 3 years. You surely are a role model - calm, intelligent, steady, sure, independent, decent and very clear in your head. At times, I feel so proud I belong to the same undergrad college (IIT Delhi), though much junior, and far less educated and capable! Heck, we just lost the guy who called the bluff of every blue-blooded economist and investment banker in the US in 2005, 3 years before the recession hit. Can't see anyone in sight that capable! And just in case you think I am a Modi-hater, read this! I am a good follower of you sir. I might see things wrong but cant doubt on your words and your conclusion cause you teach and i learnt from you. 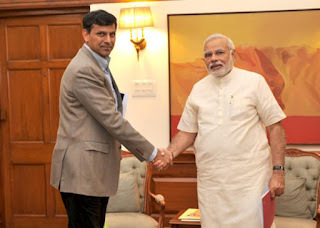 I am also little bit sad but expecting a better tomorrow and wish best for Governor Raghuram Rajan. 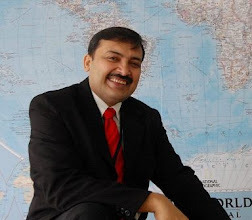 It is always enlightening to read your blogs sir. Ramjan is the most active governor I have ever seen, he gave his 100% throughout his tenure using his vast experience. He is the one who started MPC. He has always been criticised for not cutting the rates, but he did what was best for RBI and economy at that time. Let's hope government will find the right replacement of the Rajan.